We are back from the Barrier and will post about that soon. Meanwhile, here is a somewhat late post about the work we accomplished during our haul out. 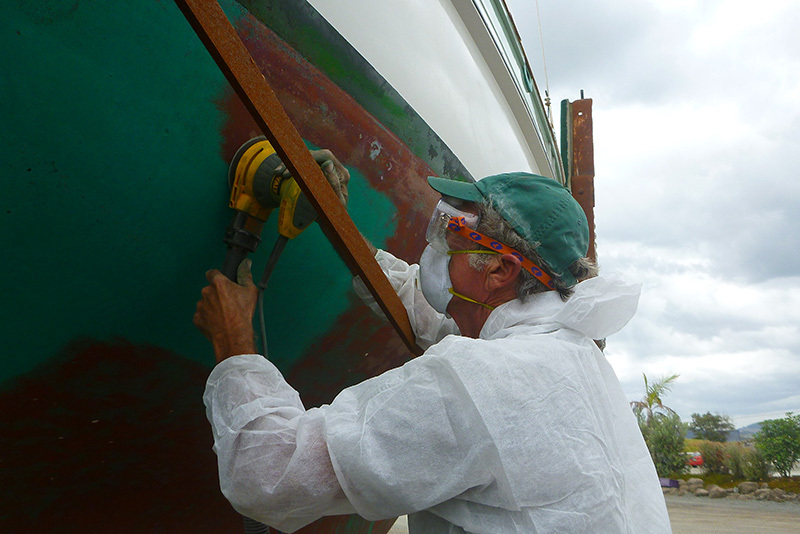 After a year and a half underway with more cruising planned, it was time to renew our bottom paint/anti-fouling on Silhouette. We also had a short list of below-the-waterline- projects that required being “on the hard” (out of the water) in order to complete. 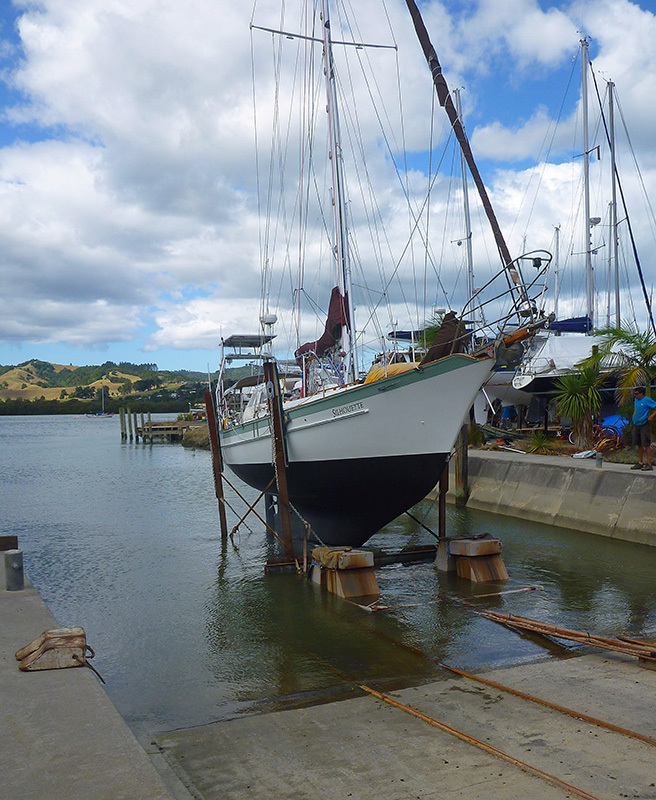 On February 25, we hauled out at the Norsand boat yard on the Whangarei River. It was our first time being hauled out using a cradle system. 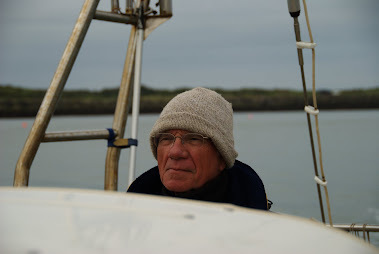 Cradles are very gentle on full keel boat such as ours; but had we the benefit of experience; we would have requested extra blocking so that less of the bottom of the keel was in contact with the cradle blocks. In the end, much of the bottom of our keel did not receive bottom paint because there were eight points of contact between our keel and the blocks in the cradle. More experienced cruisers, who had used the system before, knew what to ask for before hauling out. We also found that the haul-out using the cradle system was very time-consuming and labor intensive for the yard workers; however, this was not necessarily reflected in the charge to us. 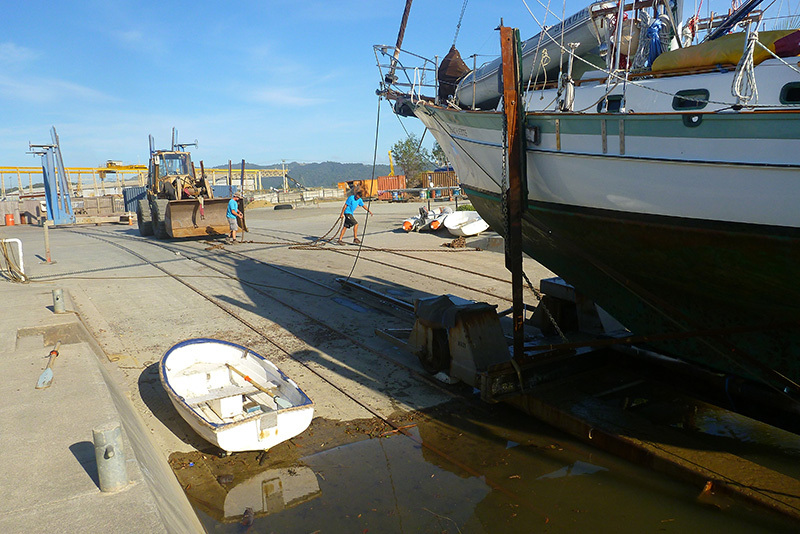 Once clear of the slipway, Silhouette received a much needed pressure wash. It was clear at what point along the hull it had become difficult for us to clean it by free-diving. 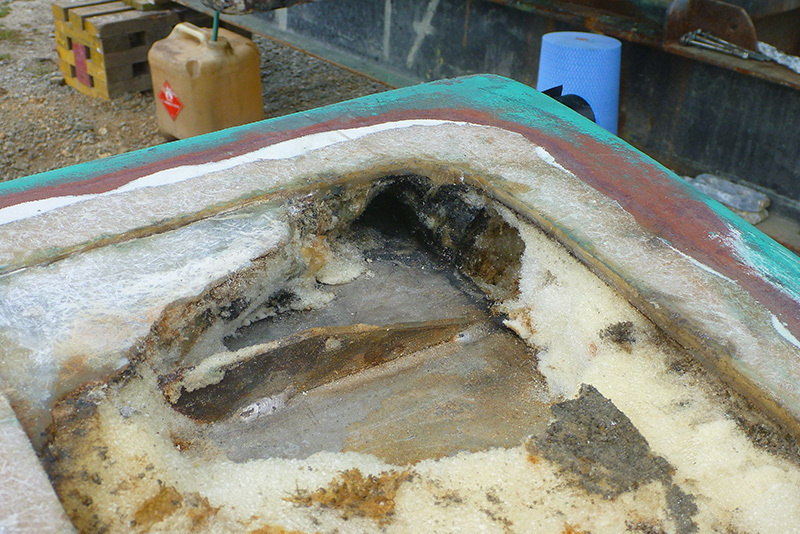 While the waterline and part of the hull were clean, there was a lot of growth beneath the rounded curve of the hull. We picked up this algae along the keel somewhere in Tonga. 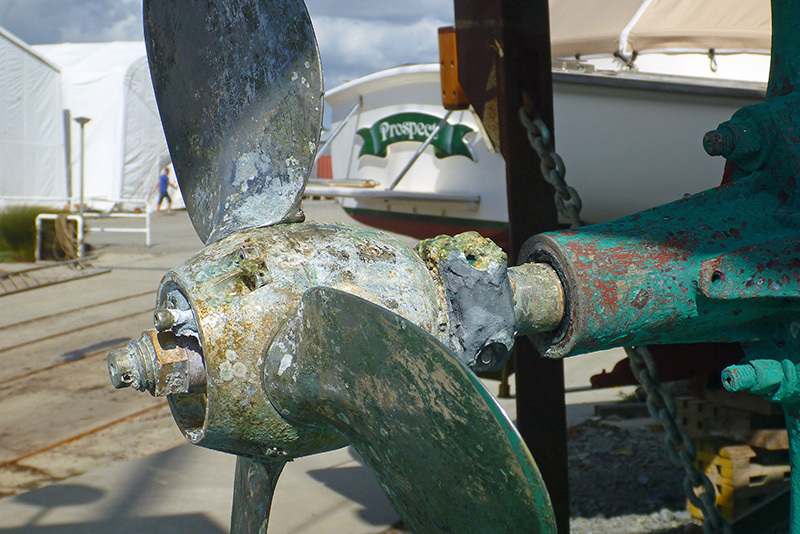 It was also obvious where we had cleaned the prop in the past from the barnacle scars that remained. The nose cone zinc on the prop is completely gone in this picture, while the zinc around the prop shaft, last replaced by Patrick in the Marquesas, is partially eaten away. 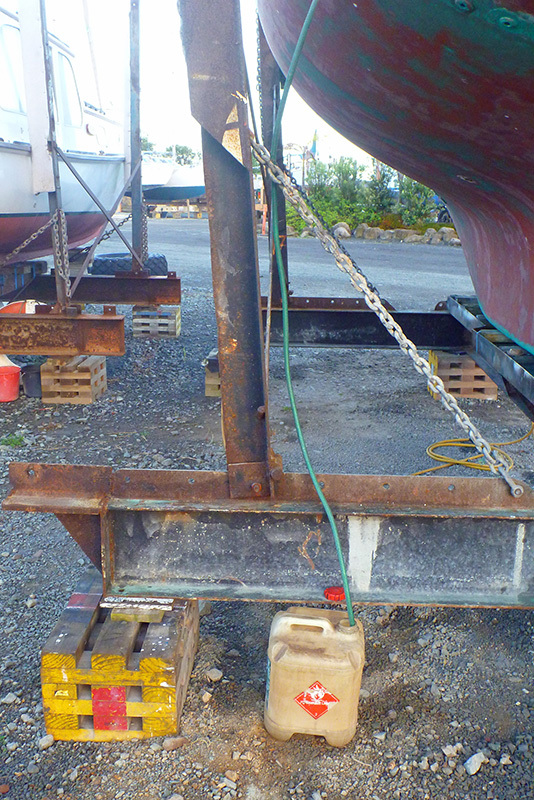 Here is what the prop looked like at the end of the haul-out: clean, with new zincs and anti-fouling applied. 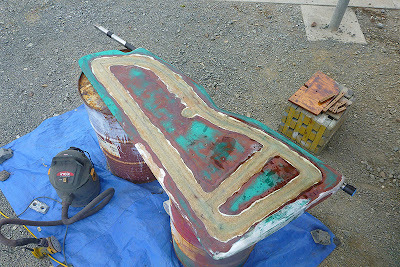 One of the primary agenda items for the haul out was to sand, prime, and paint the bottom. Although I sanded 75% of the bottom, the only picture that exists is of Patrick sanding the bottom. I ended up sanding most of the bottom because it was something I knew how to do, and it made more sense for Patrick to use his time and expertise elsewhere. After sanding, we primed and painted the bottom together. 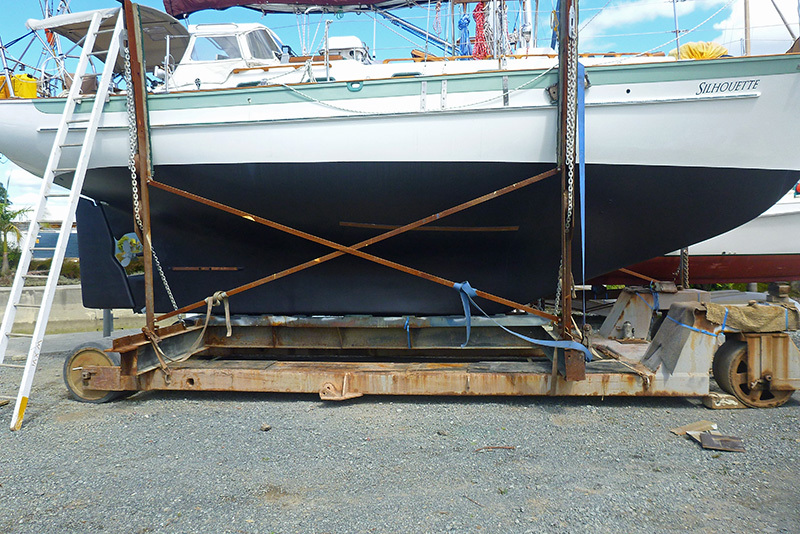 We had a different choice of bottom paints in New Zealand, and ended up choosing Jotun Sea Force 30 for the hull. Gary, this one’s for you: We ditched our boot stripe on this round of bottom paint and raised the level of the anti-fouling. Silhouette now has a black hull. In addition to the bottom job, our time in the boat yard was spent working on a few key projects. Patrick did a major reorganization of our lazarette space, in order to make the entire space safer and more easily maintained. He replaced the cockpit drain and propane locker hoses, and cleaned, lubricated and exercised the through-hulls. He re-routed other wiring and hoses. He moved our cockpit fuel tank and one of our large, 8-D batteries a bit forward so he could remount two batteries, improving the way in which they were secured. Finally, he added hardware for a new SSB ground that we mounted externally on the hull. We also removed the old and degraded Dynaplates from Silhouette’s hull and added a new copper lightning ground. In order to mount this, we had to empty our spares cubbies from under the starboard settee and (shudder) drill new holes through the hull. Of course, Patrick made these new holes over-sized and filled them with epoxy before drilling holes through the epoxy plugs for the new hardware. 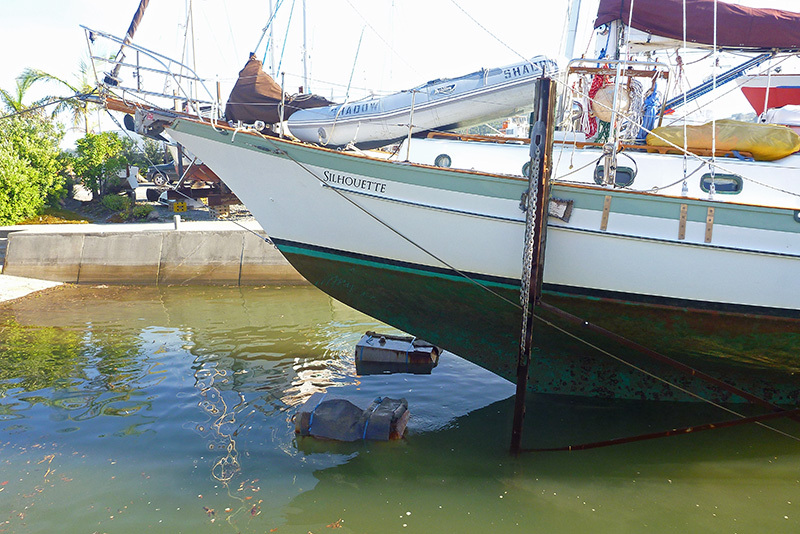 One of the major projects on our agenda for this haul-out was to remove the rudder and inspect the inside. 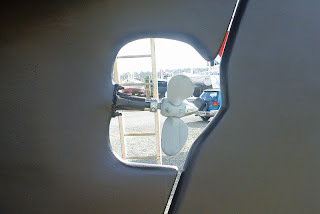 We knew we had some water ingress through some pin-sized holes in the rudder discovered during our previous haul-out in Port Townsend; but we also knew the rudder was stoutly built and did not consider this a deal-breaker for the South Pacific crossing. In the meantime, Patrick began researching the rudder issue and found that it was a chronic problem among Cabo Ricos like ours, built in the early to mid 80’s. 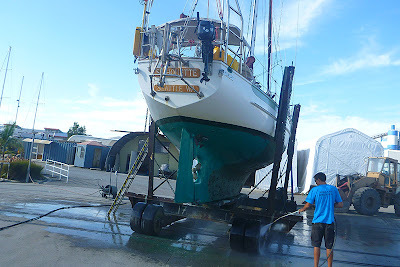 (To be fair, water entering the rudder is a chronic problem for many types of cruising boats; it is not a problem unique to Cabo Ricos.) 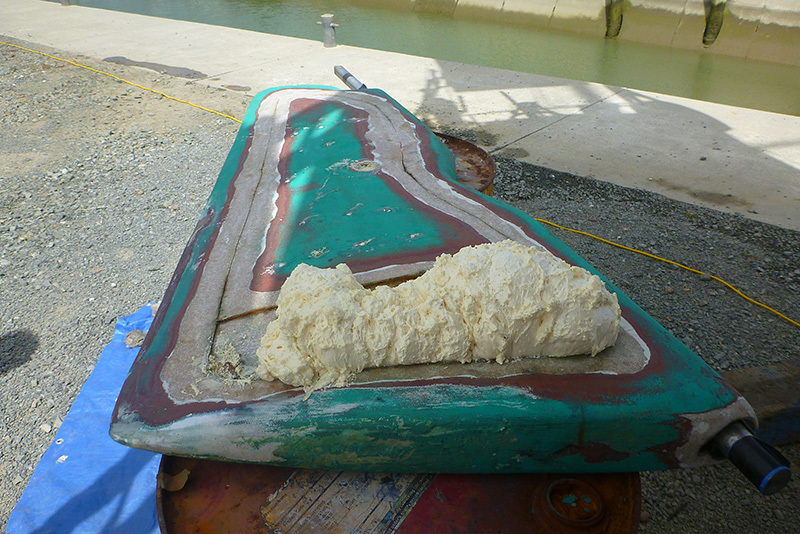 On the Cabo Rico online User’s Group, Patrick found reports from others who had “scooped out sodden masses of foam” when they’d opened their rudders for repair. We expected to have to do the same. 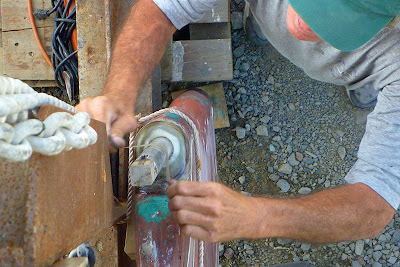 Upon arrival in the boat yard, we drilled several holes in the rudder to begin the process of draining the rudder. After dropping the rudder, Patrick ground down a groove around the entire perimeter of the rudder. 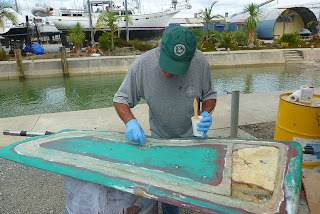 He planned to fill this with layers of epoxy and fiberglass cloth after the rudder repair in order to restore the original shape of the rudder. Next, he cut through the rudder using a “Multimaster” tool. Our first road block came when we tried to pry up the panel Patrick had cut from the face of the rudder. 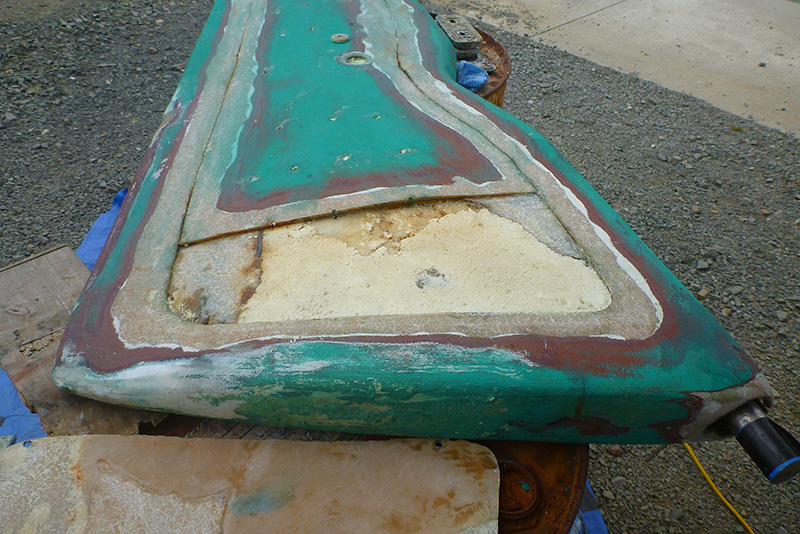 Clearly, the rudder was in better shape than we expected. While on the one hand, this was great news; on the other hand, we had just created a lot more work for ourselves. Patrick reduced the size of the panel to be removed by making a new cut across the bottom of the rudder. 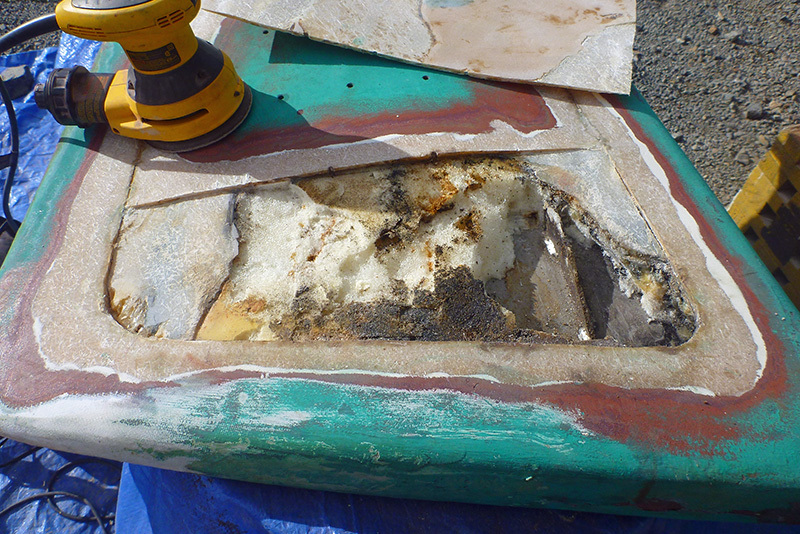 We found that the foam was deteriorated in the lower corner around the rudder shaft, but that the rest of the foam in the rudder was still in good condition. Although we found evidence of some corrosion, Patrick inspected the weld of the steel flange to the rudder shaft and found it to be in good shape. He also made another cut about halfway up the rudder (using a hole saw) in order to inspect a weld further up. 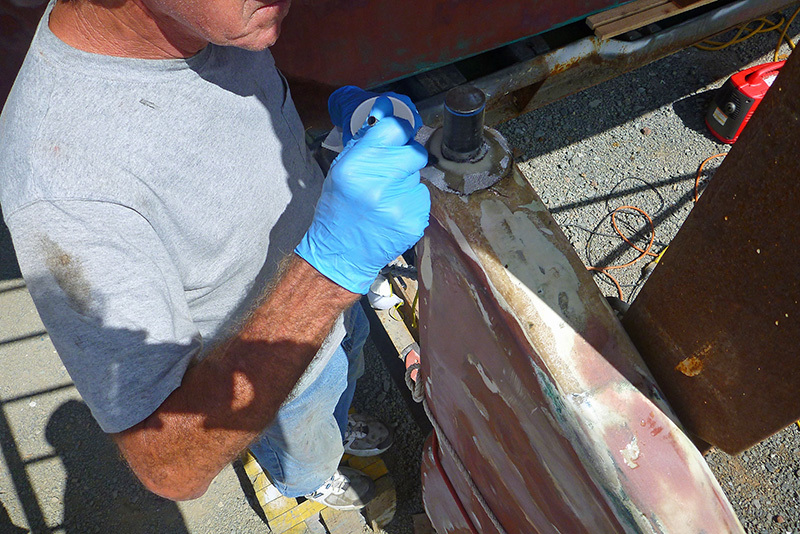 Upon sanding the paint off to inspect the ends of the rudder through which the rudder shaft passes, Patrick discovered cracks in the fiberglass at both ends. These cracks were largest at the bottom of the rudder, and were probably responsible for more water getting into the rudder than the small pinholes we’d discovered earlier. Stress cracks like these are common among rudders of this type of construction. 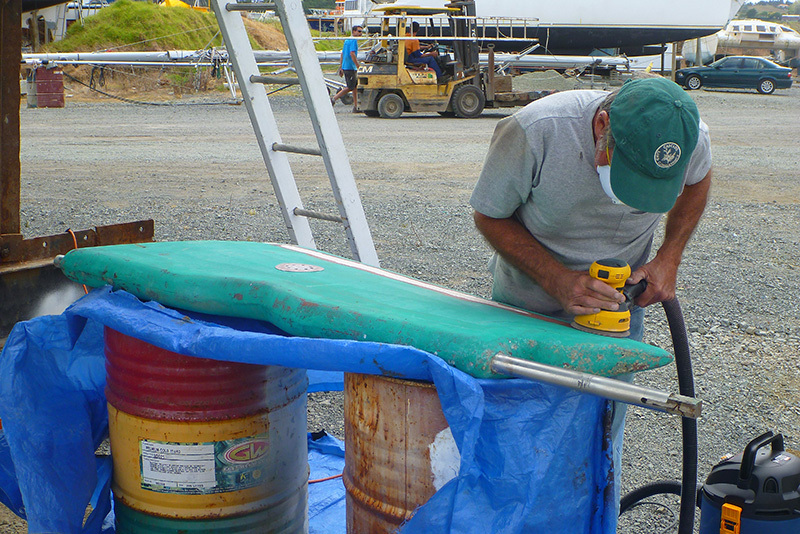 After assessing the damage and allowing the rudder to dry in the sun for a few days, Patrick began the process of putting the rudder back together. We first had to replace the foam we had removed. 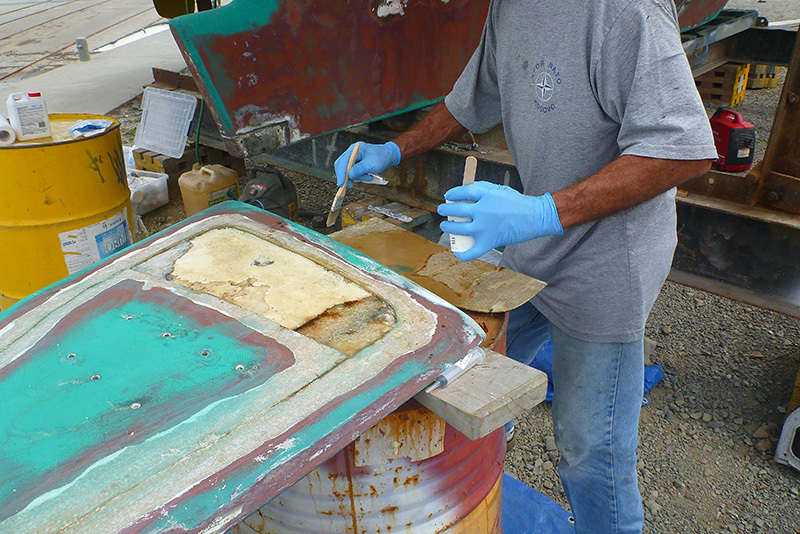 The excess foam was cut off, and then sanded, to restore a smooth surface to the rudder’s interior. Patrick then filled all the holes he’d drilled in the rudder (to drain or inspect it) and the cut he’d made around the perimeter with epoxy. Next, he built up layers of fiberglass cloth and epoxy along the cut and groove he’d made in the rudder’s perimeter in order to seal the rudder further and to restore its original shape. He started layering on pieces of cloth, in varying widths from wide to narrow strips, in order to build the joint up to its original strength. Patrick then faired the panel he cut off and glued it back over the hole in the face of the rudder with epoxy. He added more fiberglass cloth around this panel. In order to repair the ends of the rudder, we lashed the rudder to the cradle. We turned the rudder upside-down after the repair on one end was completed, in order to repair the other end. To repair the cracks on the ends of the rudder, Patrick filled the cracks with tubes of rolled fiberglass (again, applied with epoxy.) Then, he added discs of heavy fiberglass cloth to build the rudder back up around the shaft where he had removed the foam. Like the cloth he applied over the cut in the rudder’s face, he built the size of the fiberglass discs up, in this case progressing from smaller discs to larger discs. 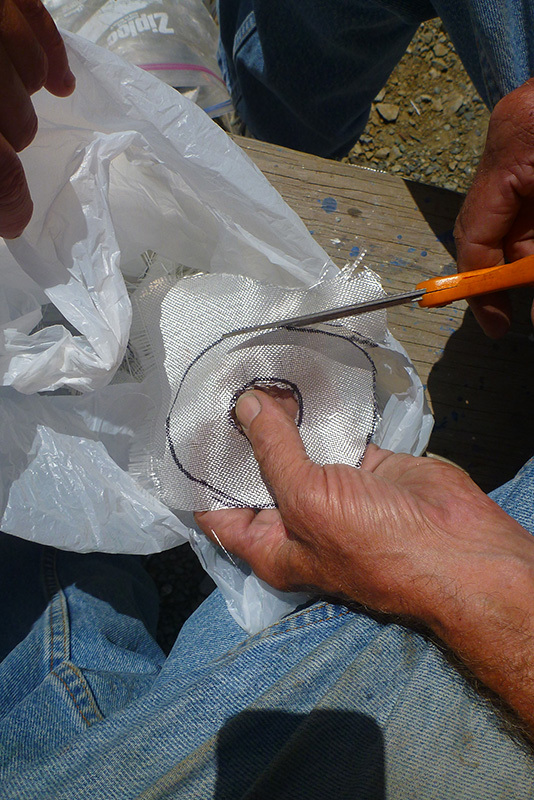 A layer of five to six cloth discs were applied with epoxy and allowed to cure before adding a second layer. 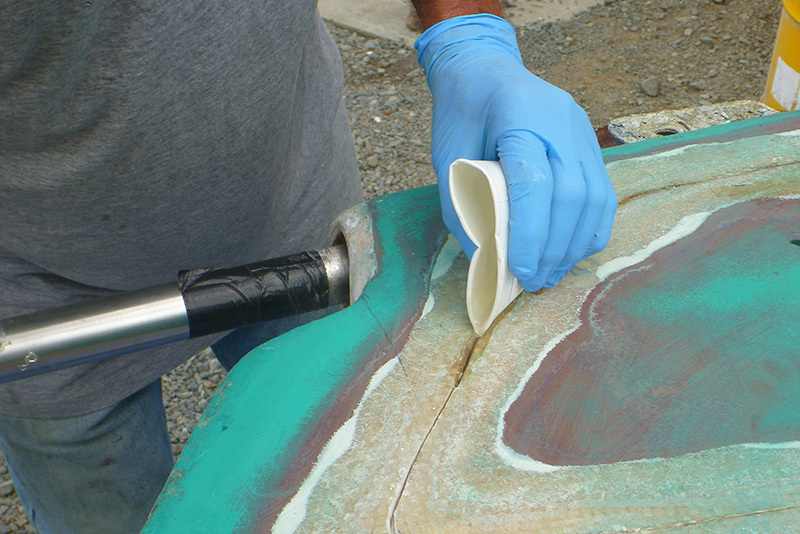 Once the repair had cured, the area around the rudder shaft was also sanded and smoothed. The problem we encountered with our rudder and some of the methods used to repair it are described in the online fiberglass repair manual West System Fiberglass Boat Repair. 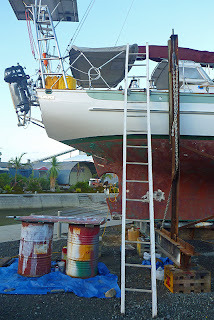 We hung the repaired rudder prior to priming it and giving it several fresh coats of bottom paint. While we didn’t feel that the rudder issue had become a structural problem yet; we will rest easier knowing we have now addressed the issue of water ingress to the rudder, and hopefully, have prevented it from creating a major steerage problem for Silhouette. I also completed my first fiber glassing project while in the yard. 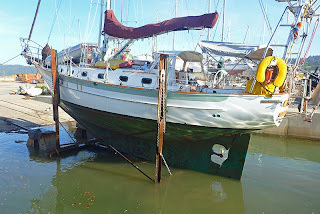 Although this was not technically a yard project (below-the-waterline), I had time on my hands while waiting for the rudder repair to be completed. Since the bow sprit is a structural element of the boat that helps to support the headstay, it was necessary to address the wood damage issue. 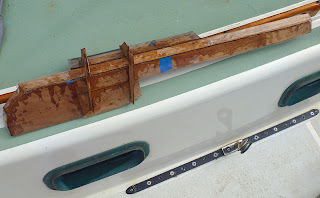 To make a protective fiberglass shell for the bow sprit, I first procured some thin (1/8”) plywood to build a mold by shamelessly dumpster diving in the boat yard dumpster. Then, I measured the bow sprit and drew the necessary pieces for the mold onto the plywood. I cut the plywood pieces out using a jig saw. Next, I taped the mold onto the bowsprit and painstakingly glued the pieces together using five-minute epoxy. After the epoxy had cured, I lined the inside of the mold with cellophane tape so that the fiberglass and epoxy I would add later wouldn’t stick to it. Patrick sprayed the inside of the mold with some mold release compound for good measure. Patrick taught me how to layer the fiberglass cloth into the mold and glue the layers together with epoxy. We applied three layers of cloth to the inside of the mold and let it cure. Then we popped the beginning of the protective shell for the bow sprit out of the mold. I trimmed away any excess cloth with scissors and sanded the entire mold with sandpaper. 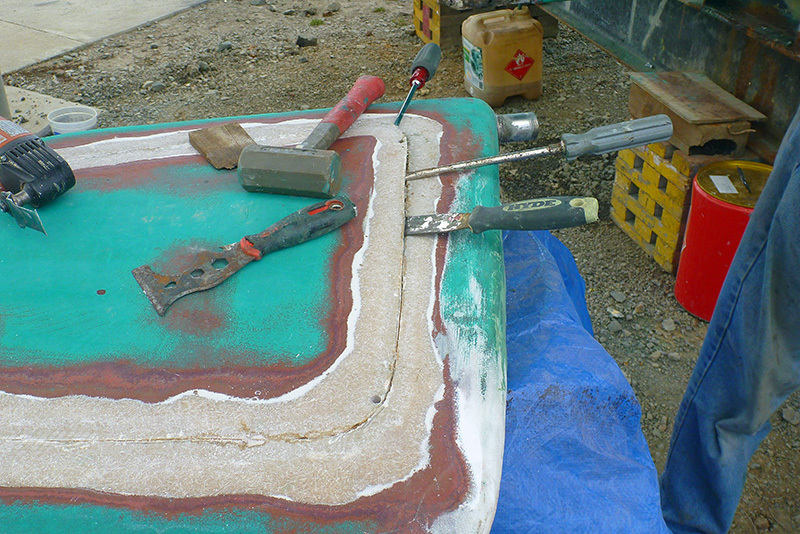 I then added three more layers of fiberglass cloth and epoxy, this time, to the outside of the existing shell. In this way, I could continue to build up the strength and thickness of the shell, while making sure the finished shell would still fit on the bowsprit. Lacking a mechanical mind, this is the type of key detail I would normally omit the first time I did a project like this on my own, having to learn the hard way when the mold didn’t fit. But with Patrick’s tutelage along the way, I did it right the first time. 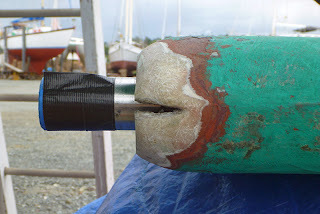 Again, I trimmed away any excess fiberglass (this time using a Dremel tool or a file), and fitted the finished bow sprit protector to the bow sprit. 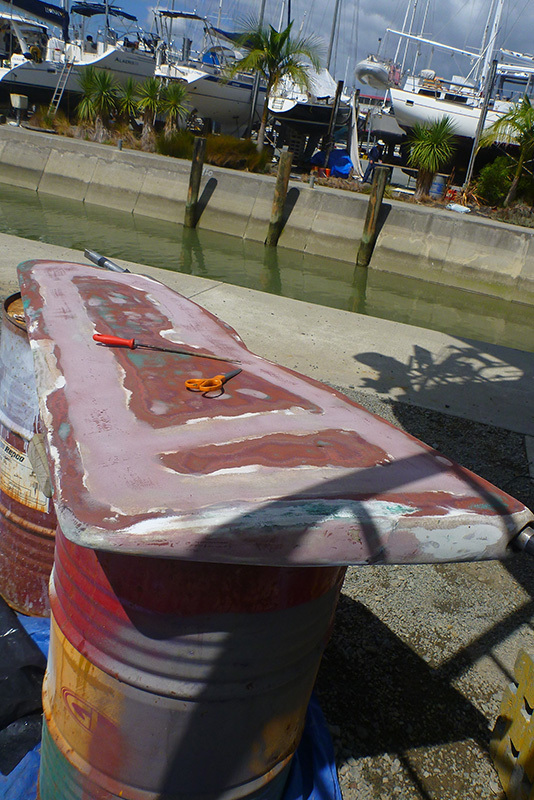 Finally, I sanded, cleaned, and spray painted the bow sprit protector. The color in the spray paint can (burgundy) did not match the color on the lid (brown), and I was disappointed in the finished color. 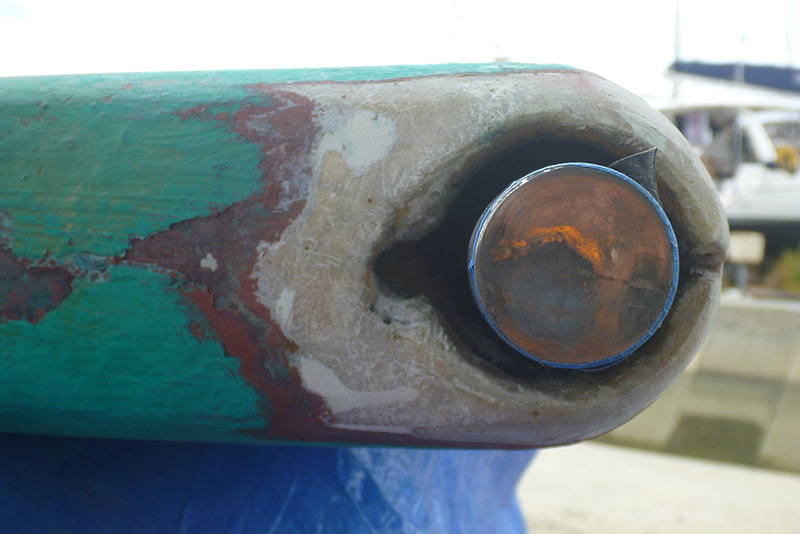 However, the bow sprit protector is functional, and we can always paint it another color at a future date. I feel proud of my accomplishment, and just completing this small fiber glass project gave me a better insight into boat building using fiberglass and resin. 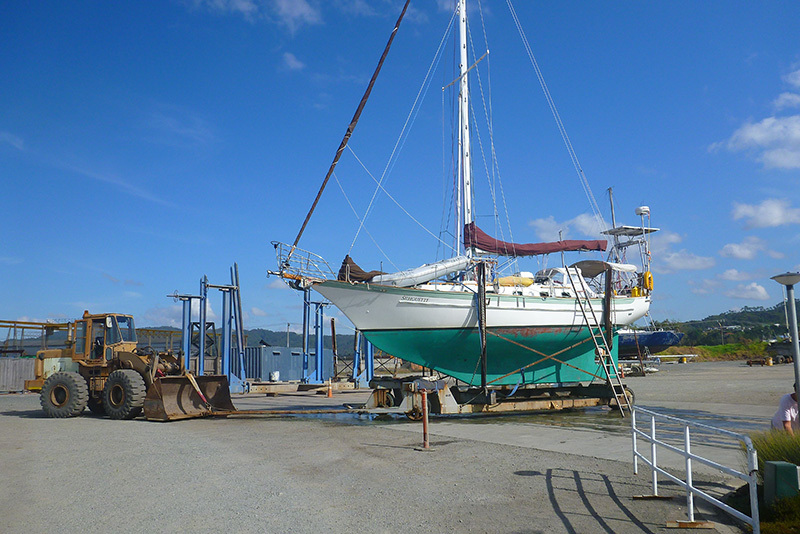 For our non-sailing friends and family who have never spent time in a boat yard, these images give you an idea of what it’s like. One of the benefits of being on the hard is that we get a lot of exercise. Here is what our front door looks like when we’re hauled out. We go up and down the ladder dozens of times a day. Patrick and I haven’t yet had to install a pulley system for hauling groceries aboard, but we can foresee that possibility somewhere down the road. We saved ourselves a lot of time and energy in the yard by making the car a temporary workshop, so we didn’t have to haul most of our tools up and down with us every day. We just stored them in the car at the end of the day. Most of our tools didn’t work in New Zealand, since U.S. tools are built for 120 volt power sources and New Zealand uses 240 v. We purchased a new Shop-Vac and power cord at the local hardware store, and the vacuum was the only tool we ran from the power source in the yard. (We were able to sell the vacuum and cord to the yard for half their purchase price at the end of the haul out.) We used our recently purchased Honda generator to power all our other tools while in the yard. Without a power source, one would be hard-pressed to do one’s own work during a haul-out in New Zealand, and would either have to invest in new tools or in labor. Emptying your gray water is another aspect of the boat yard fitness program that most people at home don’t think about. On land, gray water just goes down the sink or bathtub drain; on a boat, it usually exits the boat through hoses and a hole in the boat called a through-hull. 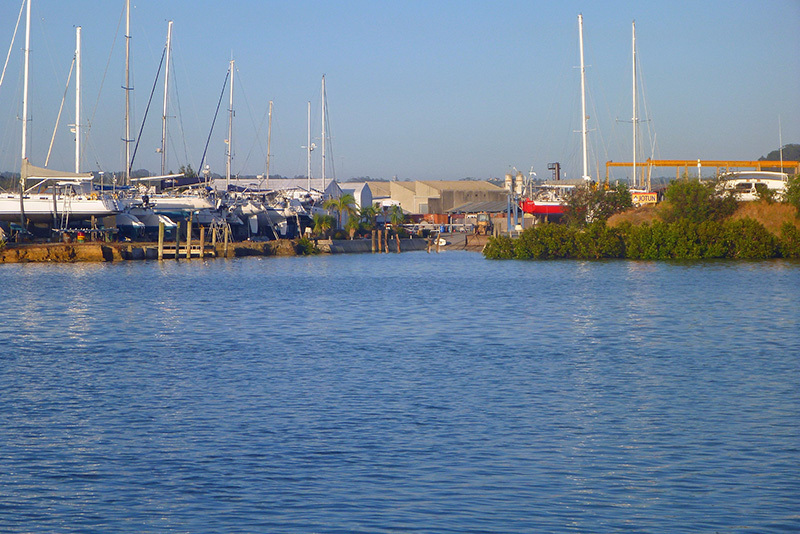 In the boat yard, the gray water still exits the through hull, but most yards have regulations about dumping it on the ground. Therefore, hoses are attached that empty the water into five-gallon jugs, buckets, or jerry cans. When full, the jugs need to be hauled to a drain leading to a wastewater treatment system or septic system (just like your plumbing at home) and emptied. We perform this task about once a day. 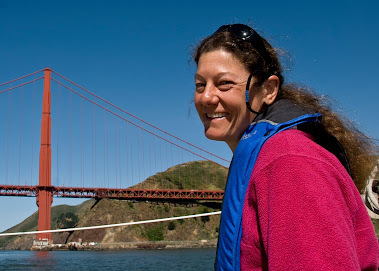 Although we use the boat yard toilet, shower, and laundry facilities while on the hard, we still use between five and ten gallons of water a day for washing hands between dirty jobs, cooking, washing dishes, and brushing our teeth. 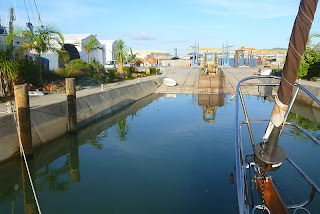 We launched the boat on March 20 after completing all our under-the-waterline projects. We missed our first splash date on March 15, but the Norsand crew was able to squeeze us in before our second date (March 25) when they had a no-show on the 21st. 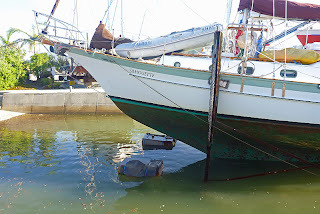 We had a moment of drama once the cradle was in the water and we began checking the through-hulls. 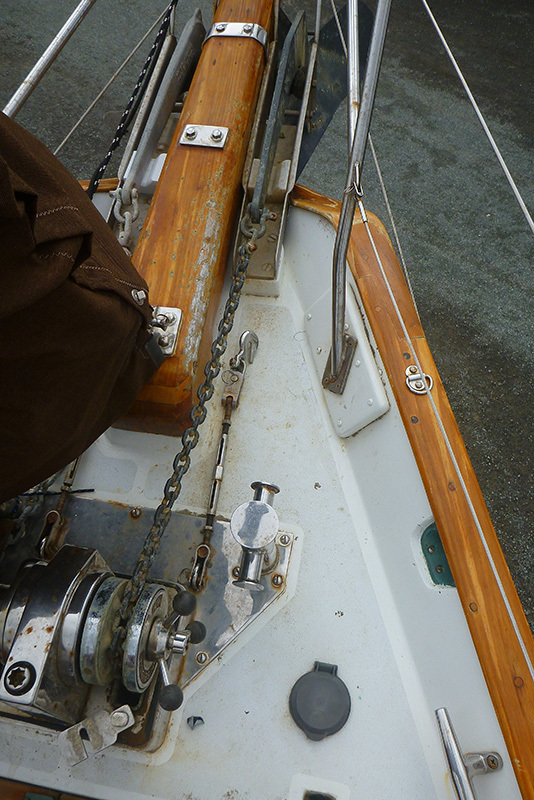 A new seacock that we had fitted to one of the bronze through- hulls on the boat was leaking. There was only a tiny drip coming from the seacock, but there should have been no water at all. After inspection, Patrick decided that he could fix it without the yard workers pulling the cradle back on the hard. They pulled us up enough so that the through hull was above the water, and Patrick resealed the seacock, adding more thread tape and sealant. When they lowered the cradle again, we were (and have remained) leak-free. Patrick immediately got to work on the engine by installing a new set of injectors he’d had serviced in Whangarei. He also made a minor change to the installation of the Walker Airsep plumbing, used to help reduce the positive crankcase pressure our aging diesel suffers with, and serviced numerous other small items. Nothing major, just the kind of maintenance needed to keep the engine running reliably. The only major item was regarding the exhaust riser. The exhaust riser is a welded pipe assembly that connects the engine exhaust manifold to the water lift muffler. This type of assembly is common on many boats and requires replacement occasionally because through it flow hot and corrosive exhaust gases and saltwater for cooling the exhaust. 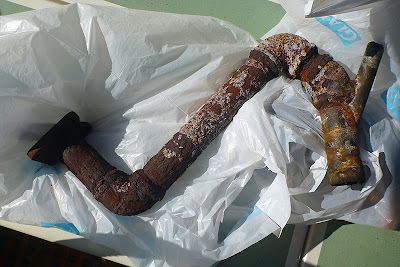 Patrick had a hunch about the exhaust riser and when he removed the asbestos insulation from the part (the asbestos gives you some idea about how long ago it was last replaced), he found a corroded metal pipe resembling lichen-covered basalt. It wasn’t leaking yet, but failure wasn’t far away. Is it a boat part or a geological formation? 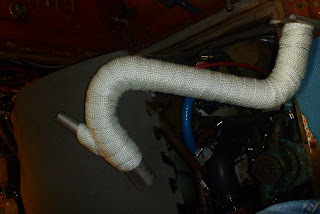 He made measurements and a drawing and took them, along with the old unit, to a welder to have a new exhaust riser made. ETA: two weeks, due to the busy Easter season. I wondered if we’d ever go cruising and set about preparing to renew the varnish on the caprails and bowsprit. I had gotten six coats of varnish on the hand rails while we were in the yard. 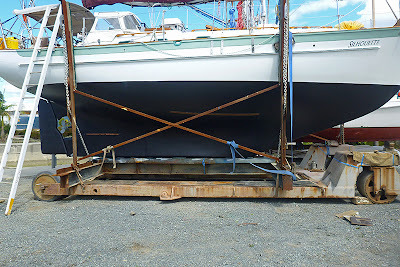 We decided that the varnish on the starboard side (which we had sanded down to bare wood before varnishing in Mexico) was in better shape than the varnish on the port side (which we hadn’t.) I sanded and spot-varnished any bare wood on the starboard side and just gave the rest of the rail a light sanding. 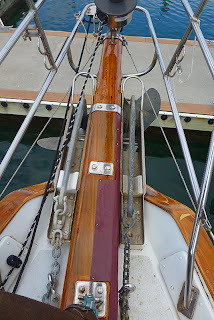 I removed the hardware from the port side (Patrick helped me with the genoa track), sanded it down to bare wood, and then masked both caprails to be varnished. I sanded the damaged areas of the bowsprit back to bare wood, gave the forward section a light sanding, and masked the base of the bow sprit off. For a period of several days, Patrick and I tag-teamed on applying the varnish together, so that we could get as many coats as possible on everything in our remaining window of dry weather. After completing the varnishing, we made a run to Opua to retrieve postal mail and buy some new running rigging at a chandlery where we have an account and get decent prices. 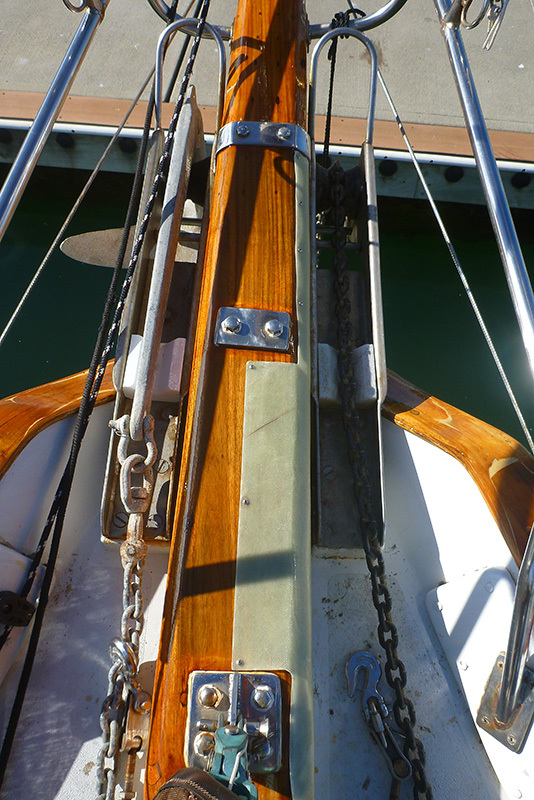 After more than 11,000 miles of sailing we wanted to change the length and diameters of several lines and also needed to replace several items due to normal wear. On our way back from Opua we picked up our new exhaust riser, and Patrick reinstalled the exhaust riser and tested the engine. We forgot to take a picture of the newly welded exhaust riser before Patrick wrapped it in its new "sweater." At this point, we were ready to leave the dock, but we heard from friends that they were coming through town at the end of the week. We decided to delay our departure to visit them, and---no surprise---the skipper wanted to check out an issue with the water maker anyway. 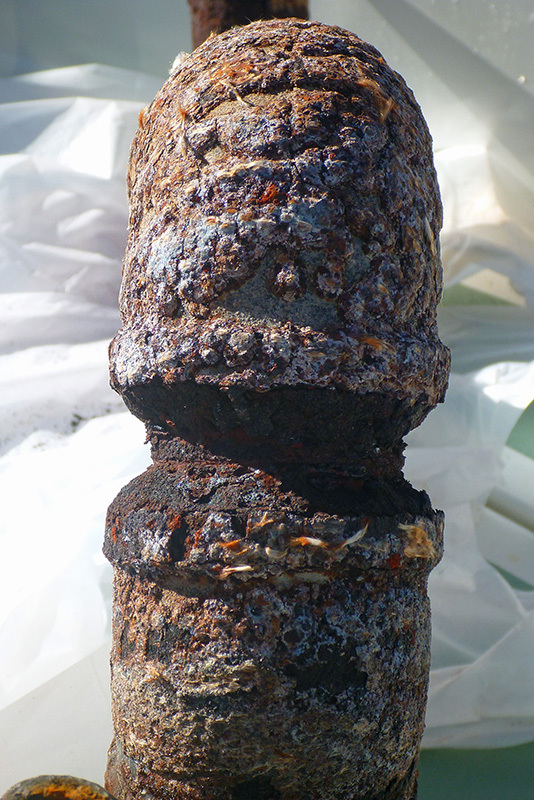 Patrick had recently replaced the membranes on our Little Wonder water maker (Village Marine) and was surprised that the TDS (Total Dissolved Solids) meter showed 350-400 ppm (parts per million, that would be salt) with brand new membranes. He was expecting a reading of 100-200 ppm. He took the water maker apart and replaced several key O-rings but got the same reading. We decided it is what it is. In the meantime, I worked on putting eye splices in both ends of our jacklines. We then removed the excess (slack) webbing protecting our jacklines (from UV and chafe) ---which tended to bunch up---resealed the ends of the webbing with a hot knife, and seized them to the jacklines. Our goal was to make the jacklines stronger and less stretchy. 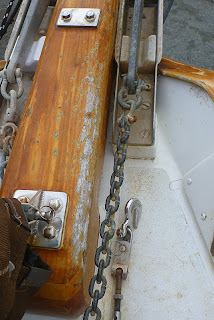 Patrick also climbed the mast and installed a new spinnaker block and halyard on the starboard side of the boat. During our South Pacific crossing, we had experienced chafe issues with the spinnaker halyard due to the way the block hung from the masthead. We decided to remove the masthead fitting for the spinnaker block, and have it re-welded for the purpose of attaching two spinnaker blocks and two halyards: one for either side of the boat, and to improve the lead of the halyards. We sourced this job out to the same welder who did our new exhaust riser. 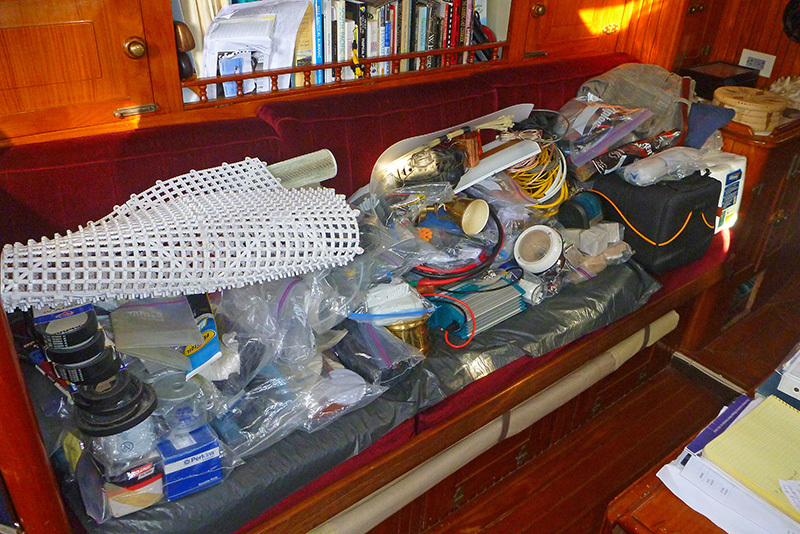 Our chandlery was out of halyard material for the second spinnaker halyard, so we will replace that when we get back from Great Barrier Island. Our delay at Marsden Cove marina allowed us to visit with three boat crews that we had met along the journey, all of whom seemed to be converging in Whangarei the week we were planning to depart. 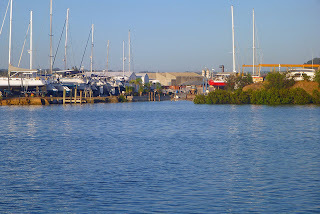 After our “old home week,” we were finally ready to leave the dock: laundry (check), groceries (check), water (check), diesel (check), propane (check), gasoline (check), marina bill paid (check), and we were off! What a lot of work you did in the yard! Thanks for the blow by blow reporting. 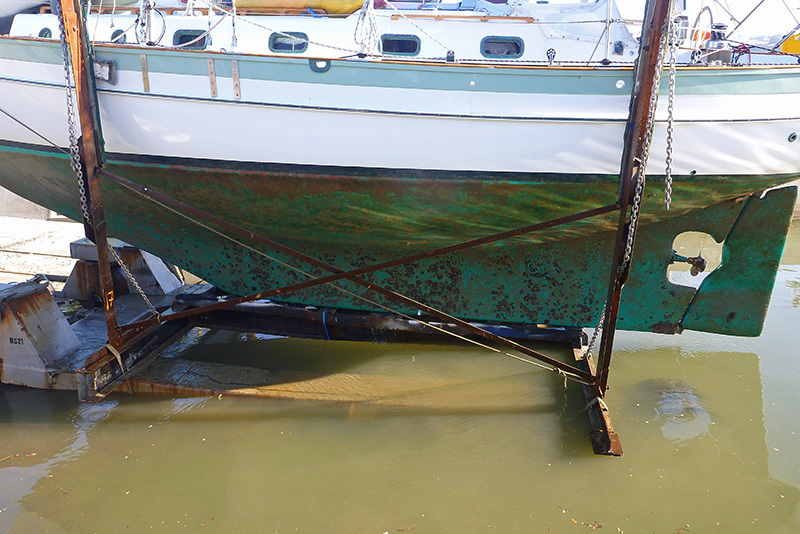 So that's how you fix a waterlogged rudder.